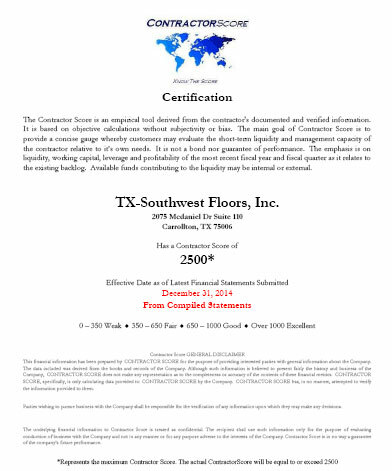 Texas Southwest Floors, Inc. is dedicated to serving the Dallas/Fort Worth and Houston areas in the multifamily, new construction, retail/commercial, and residential capacities. Owned and operated since 1995, Texas Southwest Floors Inc. has developed an enduring reputation of sound workmanship, excellent product knowledge, and the highest levels of quality and customer service for our clients. Because we can purchase our materials directly from the mills, we are able to pass on significant savings to current and new customers. We specialize in the replacement of carpet, hard surfaces such as luxury vinyl tile, sheet vinyl, tile, and ceramic, as well as wood and rubber flooring. We also provide granite and backsplash products along with installation. We strive to provide you with unparalleled customer service and installation while delivering durable and cost-effective products in a timely manner. Texas Southwest Floors, Inc. warranties all workmanship on installations for up to 13 months and provides the personal attention that you as our customer requires. We realize you have a choice in when selecting a flooring company, and we look forward to not just meeting, but exceeding your expectations.